An activist comments on the implications of recent arrests of anti-fascists at demonstrations opposing the English Defence League and the British National Party. In the space of just over three months this year, police made upwards of 340 arrests of anti-fascists in London. Of the arrests made over two occasions, less than a dozen will proceed to trial. ‘No Further Action’ has been taken against the vast majority of those arrested, raising questions about the credibility of the grounds for arrest. But Wednesday 6 November saw the first court date for five anti-fascists arrested on 1 June. All five pleaded not-guilty and will present a united defence case, in a five-day trial due to take place in April next year. On 27 May 2013, less than a week after the killing of Lee Rigby, the English Defence League (EDL) organised a protest outside Downing Street in central London. Estimates of the number of EDL supporters in attendance ranged from 1-3,000. A smaller number of anti-fascist demonstrators, around 600, were present to voice their opposition. Toward the end of the protest and counter-protest, anti-fascists were forced to retreat under a hail of glass bottles, cans, sticks and other debris thrown by EDL supporters over the heads of the police and into the crowd of their detractors. Police said thirteen arrests were made over the day, but it was only by chance that the crowd of anti-fascists, which included wheelchair users and the very young, did not sustain any serious injuries. Three days later, Nick Griffin, the leader of the British National Party (BNP), used Twitter to make a ‘personal appeal’ to EDL leader Tommy Robinson to join him on the BNP’s own anti-Islam protest the following Saturday. Griffin had originally planned to hold a march from Woolwich barracks to the Lewisham Islamic Centre, but the Metropolitan Police used the Public Order Act to force the demonstration to relocate out of South London and to Whitehall. The BNP agreed to assemble instead at Old Palace Yard, close to the Houses of Parliament, and then march to the Cenotaph. 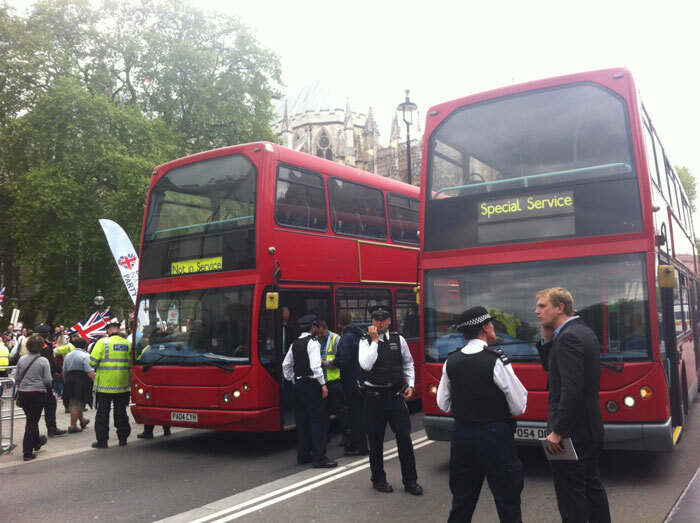 Despite the arrests, the BNP were unable to complete their march, and left humiliated. On 7 September, however, the EDL returned to London – this time to the borough of Tower Hamlets. 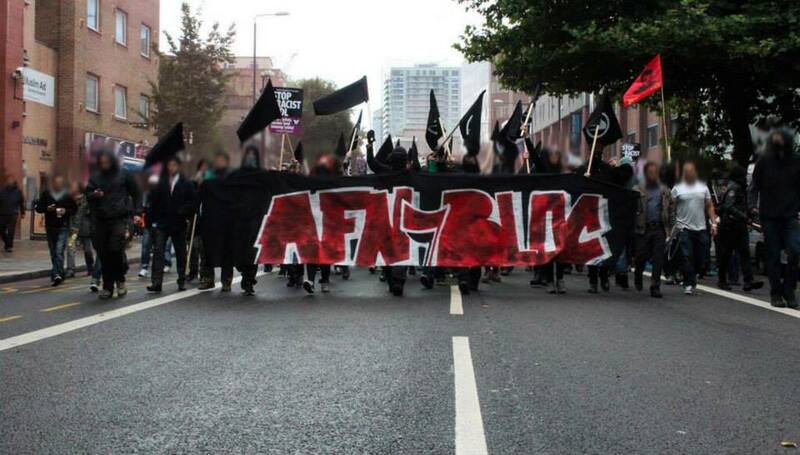 Again anti-fascists took to the streets to voice their opposition to the Islamophobic and racist politics of the EDL, and again the police responded by making mass arrests. 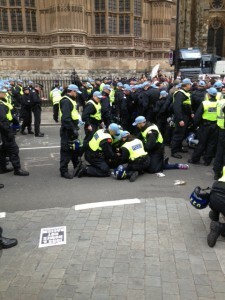 This time 286 arrests were made, including anti-fascists, legal observers and passersby. London buses were again used to send arrestees as far away as Sutton, where punitive pre-charge bail conditions were handed out en-masse. Information recently revealed under the Freedom of Information Act shows that the Metropolitan Police contacted Transport for London twelve days ahead of the planned march to inquire about hiring London buses. A booking with Sullivan Buses was confirmed by 29 August. Should the anti-fascist protestors be convicted next year on a series of public order offences, it will set a worrying precedent. On the one hand, it would imply that positions and tactics of fascists and anti-fascists can somehow be equated. On the other, it could send out a warning signal to would be opponents of the EDL and BNP that they face criminalisation just for demonstrating. That is, if the arrests themselves – and the collection of names, addresses, DNA and fingerprints that accompanied them – have not already made the message clear. Vincent Callaghan is a pseudonym.